Welcome to the Babys Gotta Have It! 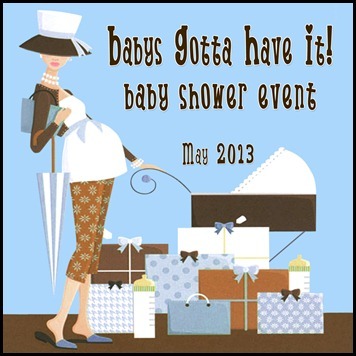 Baby Shower Event! 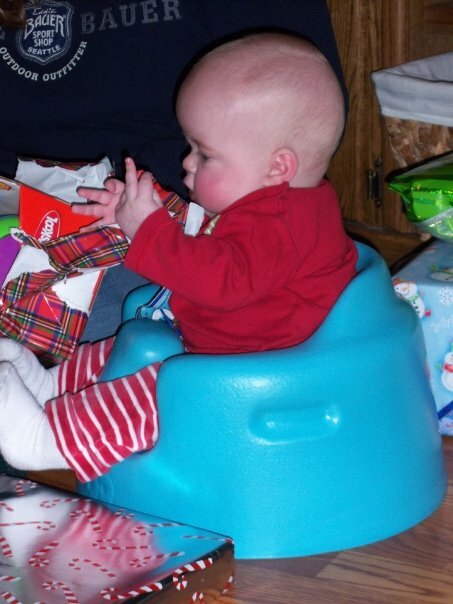 When my son was an infant I had a floor seat that was not a Bumbo, it was a different brand but seemed like the same idea. I wasn’t impressed with it at all. He was always falling to the side and I would have to stuff blankets around him to keep him sitting upright. I had expressed my displeasure to a friend about this seat and she introduced me to the Bumbo. My friend was generous and let me borrow her seat. My son was finally sitting snug and comfortable… in the Bumbo! No more stuffing blankets around him trying to make him sit up without falling to the side. I was finally in love with a seat that assisted my son with sitting. He was so happy to finally be able to be aware of his surroundings and enjoying his new view. I was sad when it came time to return the seat. With number 3 on the way I was SO excited to be getting a Bumbo to review (free of charge, all opinions are 100% my own) for this baby. The Bumbo floor seat is designed to assist your baby to sit up all by themselves once your baby can support their own head. The Bumbo seat is made out of a durable low-density foam to give your baby the best comfort while sitting in the seat. This seat is designed to fit snug around your baby to support their hips and the natural curve of the rib cage. 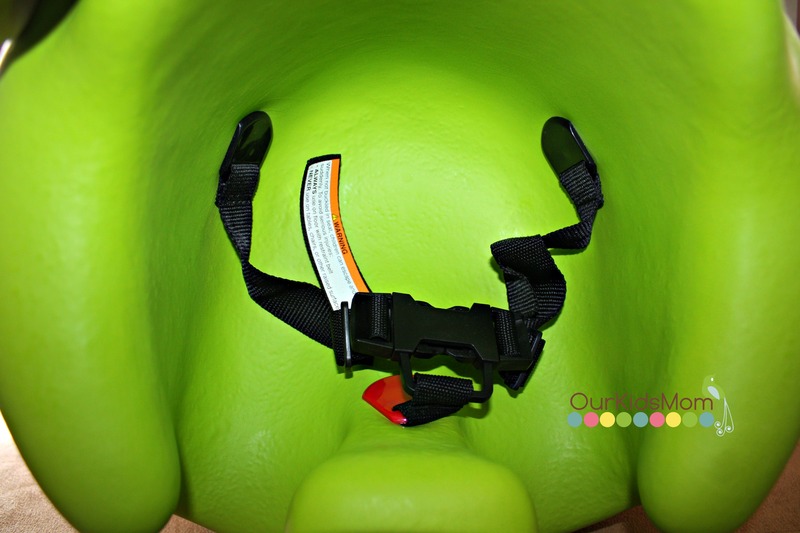 The new Bumbo seat has an installed safety harness to prevent a wiggly baby from falling out. The Bumbo floor seat is designed to be sitting on the floor or level ground surfaces to prevent any falls that may cause injury. 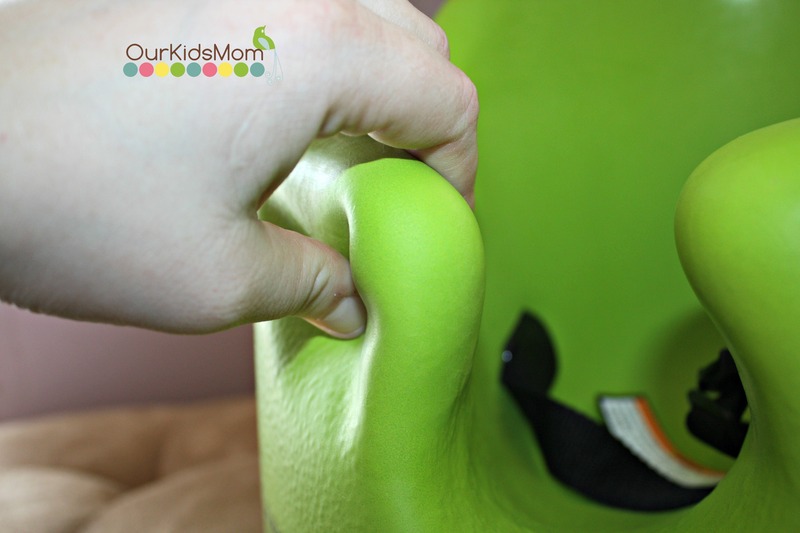 The Bumbo is super light and has a easy surface to wipe off for cleaning. This seat is great for traveling and taking out of the house with you wherever you go, even to the park to keep your baby off the dirt. There are a couple extras you can purchase for the seat including a play tray for a convenient surface to place your babies toys on as well as seat covers to dress up your Bumbo and express your own style. Bumbo has built and equipped a spacious hostel, to cater for orphans, homeless children or children in difficult circumstances. I would love the Crawl Ball! I’d love the step stool! We have the booster seat and love it! We are hoping to get a bumbo for babe #2– and maybe their stool. I like the colors/design. I want the toilet trainer! We could always benefit from a step stool. I really like their step stool for the bathroom too. very handy! I like the crawl ball. I also like all the technical features the Bumbo has to support the posture of the baby. I learned that as soon as your baby can support their own head you can seat them in the Bumbo Floor Seat. I like the step stool they have. I could use that at my house. My Abel would like the play tray. i’ve always wanted a bumbo, and seen many of my friends have them, but I never got one for my DD or DS. I love that it helps them sit up and develop head and neck muscles, and lets them be involved! I also like their Bumbo Step Stool. I’m not sure if my comment went through since the screen was blank after I pushed submit? I like the pink step stool. I learned that the Bumbo Floor Seat has received many awards from around the world. The Step Stool would be great! Their step stool would be very handy to have. i like that it has the play tray making it more versatile! I like the play toy attachment. I would love the Bumbo in either Pink or Purple! I like the step stool. Helps little ones reach the potty. Designed for safety, however do not use it on a table or any raised surface. they make trays as well that attach! I think the crawl ball seems like a great product that would be very helpful in teaching babies to crawl! i learned that Bumbo International Trust is incorporated under South African Law. Its sole beneficiary is a nonprofit organization. I’d love to have the booster seat, too! I love the green bumbo! I’d get the step stool. The booster seat looks nice. I learned they also sell a fantastic step stool and booster seat. I like their step stool! I learned they make a lot more than the floor seats, they booster seats, stools…all kinds of good stuff. I also like the step stool! I like their booster seats. I love that you can buy a tray for it! I love that they now have straps to keep the baby in. I also like that they have ones with designs and not just plain colors. I also like that they have a tray that can be attached. The step stool looks very handy! I also like their step stools. I like the play tray you can purchase to go with the seat! I like the step stool! I like the play tray. They can be at a sfae height and play with the other kids or mom and dad. I never realized the company was South African until now! I love that the Bumbo Floor Seat allows for support and baby can interact with their surroundings. I never had a Bumbo for my other boys but would love to try one with baby boy #4. Thanks for the chance to win! I like the Step Stool. I love the step stool! I love the play tray that can be added! I love the Crawl Ball! I’d also like to try out their toilet trainer. love bumbo’s . all the babies in the family had one, have a new baby that it would be wonderful f or. I have never even heard of the crawl ball. Very cute! Bumbo products are made to the highest standard using quality materials in the manufacturing process. I learned that The Bumbo Floor Seat has received many awards from around the world for its effective and functional design. I love their Crawl Ball! I like the toilet seat! i like the play tray! I like that the material isn’t rock hard! A little give is nice. I didn’t know they also made step stools and toilet training products. I liked how their was patterns on the seat and learned that a tray can connect to them. I like the play tray which is an accessory to the seat because it makes it easier for babies to play and interact with things while sitting down. I love the play tray. Mt son had one of these and I would love one for our 2nd child. the first baby sitting on the blue bumbo looks like he’s giving someone the finger…lol..so funny.